I introduced myself way back in March, but since then, I still haven't attempted at painting yet. Life just gets in the way, I suppose. Anyway, I have compiled a ton of questions and I did not want to be annoying and post them all in different sections of the board. So I hope it is okay if I just list them off here and whatever anyone can answer to would be greatly appreciated! Firstly, I enjoy watching the drawmixpaint videos but setting up my own studio and perfect lighting is not really feasible for me at this moment. I have a few concerns about setting up at home and wonder if anyone has any suggestions or can let me know if it is okay to deal with as it is. So I live in Finland, moving into winter time, the sun is hardly up and it is too cold to crack the window. I have been searching for months and I am quite sure I can not find lighting within the close-to-visible-light range. So I lack perfect lighting and ability for ventilation for my solvent. What do you guys do? Also, I live in a dryer climate, does this matter? I will only be able to paint in my home, but I am a bit concerned about clean up. Is it safe to rinse my paint brushes in my kitchen sink? I noticed on the website it is suggested to premix paint and store in the refrigerator. Is it okay to store them in my personal fridge with the rest of my food? What if I put them in a storage box that is only opened outside the fridge? Is premixing necessary? Does it effect the fat over lean method? Speaking of fat over lean. Some people paint in layers, but Mark does wet on wet. Which is better for starting out? How do people make their pallets have such small quantities of color yet are able to stretch it across an entire painting? Am I missing something? 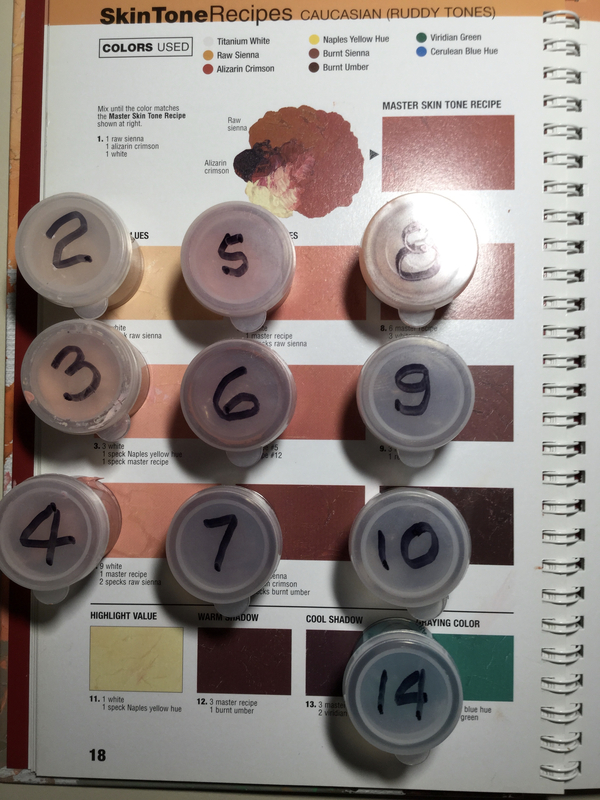 When making my pallet, if I choose to do my painting in stages, how do I save my paints? I have a glass picture frame for this. Storing a wet, whether completed or in process - what about dust in the air? Or is this just not something people worry about? Can you paint a tinted gloss coat in order to give the entire painting a hue in oil painting? Does anyone else use their computer or ipad as a reference for a photo rather than laminating? This question also concerns ventilation, but are there any precautions I should take when considering I have a cat and during pregnancy? I am not pregnant at the moment but hey maybe someday soon! Okay, I think that is all for now! Thank you for your time and helpful responses! Lighting: shop for ‘cool daylight.’ 5000k LED Lamps. There are seven IKEA stores in Finland. No doubt many other stores. Ventilation. Get some. Exhaust fan in ceiling with roof mounted motor. Schweigen in Germany make them. Solvent: Geneva Paint doesn’t use or need solvent. Could use citrus solvent. Could use water mixable oil paint with citrus. Possible to paint masterpieces with oil paint and stand oil. Storage: Stock color (bu,um,cy,pac,tw, black) mixed directly into 75 ml snap caps with SDM. Lasts two years. Each of these 10 ml containers will cover about 2 sq ft.
Storing wet: lean them face in to a wall in a warm dust free space. Store them face down with corks and pins between them. Store in drying rack with lint free fabric zip enclosure. Screen vs photo: difficult to adjust transmitted values to reflected light paint values, but possible. Expect a period of adjustment to the process.. Wet on wet is faster and simpler at any stage. Don’t store paint with food. Sealing it in a box is better, but solvents can escape, you don’t want them in your food. Suggest using Geneva paint - no solvents. Also no brush cleaning required if you use brush dip and do what Mark says. Painting thin layers uses less paint. Small palette quantities means you are either painting a thin layer, or a small area. Cold temperatures slow the drying of paint. Another way is to get really good at mixing colors, then you just use small amounts, with no need to store them. When you say “tinted gloss coat” I think you mean glaze. Answer is yes, but it requires solvent, which requires ventilation. I am successful at color matching against laminated photographs, but cannot do it against illuminated screens, it’s too hard for me. I cover my palette, but leave it unrefrigerated. Mixed paint lasts for days, piles of raw paint last for weeks. I cover the palette to keep the cats off it, and to keep the airborne fluff (cat by proxy) off the paint. Good luck with the cat pregnancy. I agree with what @dencal and @PaulB said. I can't advise you on the pregnant category but you can use the same kind of ventilation fan used in bathrooms and over the cook surface in the kitchen vented through the ceiling or wall. I recommend you DO crack a window a few minutes each hour but don't do any plein aire painting during the winter. Interesting: Linseed oil freezes at -20C.